The Internet, or specifically the World Wide Web, requires a limited virtuality in order to do its job. The shallow immersion offered to us by our computer screens actually serves our needs very well, since the Internet’s role in our lives is to connect, store and present information in accessible, searchable, scannable, and consistent form for millions of users to access simultaneously, to be dived in and out of quickly or to surround ourselves in the information we want. The naturally-immersive VR takes us partway towards Mobile AR, but its influence stops at the (admittedly profound) concept of real-time interaction with 3D digital images. What the Internet does is bring information to us, but VR forces us to go to it. This is a function of the Mixed Reality Scale, and the distance of each from The Real. The closer we can bring artefacts from The Virtual to The Real, the more applicable these can be in our everyday lives. The self-sufficient realm of The Virtual does not require grounding in physical reality in order to exist, whereas the Internet and other MR media depend on The Real to operate. AR is the furthest that a virtual object can be ‘stitched into’ our reality, and in doing so we exploit our power in this realm to manipulate and interact with these digital elements to suit our own ends, as we currently do with the World Wide Web. The wide-ranging entertainment resources offered by the Internet are having a profound effect on real-world businesses, a state of flux that Mobile AR could potentially exploit. There is a shift in the needs of consumers of late that is forcing a change in the ways that many blue-chip organisations are handling their businesses: Mobile data carriers (operators), portals, publishers, content owners and broadcasters are all seeking new content types to face up to the threat of VOIP (Voice Over Internet Protocol) – which is reducing voice traffic; and Web TV/ Internet – reducing (reduced?) TV audiences, particularly in the youth market. T-Mobile, for example, seeks to improve on revenues through offering unique licensed mobile games, themes, ringtones and video-clips on their T-Zones Mobile Internet Portal; NBC’s hit-series ‘Heroes’ is the most downloaded show on the Internet, forcing NBC to offer exclusive online comics on their webpage, seeking to recoup advertising revenue losses through lacing the pages of these comics with advertising. Mobile AR represents a fresh landscape for these businesses to mine. It is no surprise, then, that some forward-thinking AR developers are already writing software specifically for the display of virtual advertisement billboards in built-up city areas (T-Immersion). The Internet has changed the way we receive information about the world around us. This hyper-medium has swallowed the world’s information and media content, whilst continuing to enable the development of new and exciting offerings exclusive to the desktop user. The computing capacity required to use the Internet has in the past constrained the medium to the desktop computer, but in the ‘Information Age’ the World Wide Web is just that: World Wide. 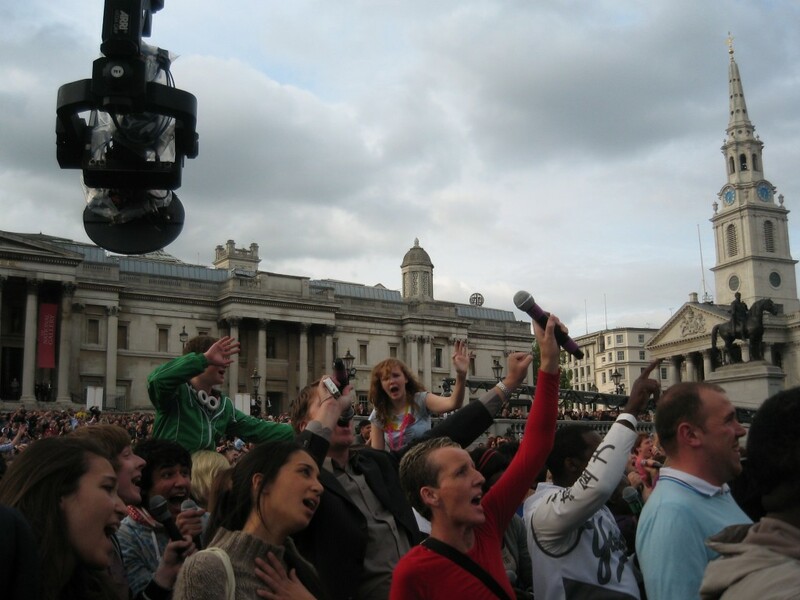 Wow – the singalong was huge. 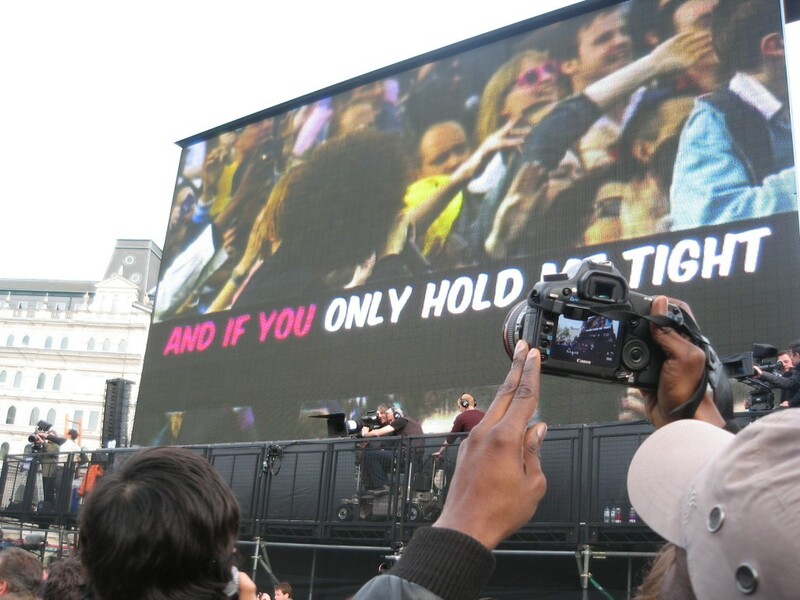 T-Mobile attracted a huge 18,000 visitors to the event last night in Trafalgar Square, who were informed of the happening through an integrated twitter, viral seeding, PR and Mobile campaign. Subscribers and visitors to the lifesforsharing YouTube channel were also informed, as were members of existing Facebook fan groups. Here are my best images taken from the front. There is no denying that this was a highly polished media affair, but it was carried off with enough honesty to create what I think was a truly positive feeling. Even Vernon Kaye was brilliant, and I usually hate him. Here’s a teaser for the T-Mobile campaign I’m working on at the moment. It is going to be huge! Please help me pass it along. More details to follow but for an early preview, check out the YouTube channel, Facebook page and Flickr group. 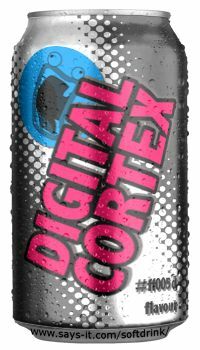 Check it out, I just made a Digital Cortex drink at says-it on their new image generator. This might be really useful when pitching to FMCG brands, or any other brand who might fancy a line in soft drinks. Zero creative costs. Imagine : the T-Mobile Magentaberry Lite, or the IKEA Swedish Rutabaga Cola. Well, I think it’s a good idea – you can even send off for fridge magnets as leave-behinds. Try it for yourself here. Vimeo looks like it has a new competitor in the HD-UGC space. This site seems to favour long-form video through the promotion of made-for-web series. These guys have a fairly solid looking mobile publishing solution, and a much cooler brand image than Bango or DotMobi. Not sure how their analytics are. I used to love this series, and then it went dark for a while. Now I hear they are completing the series and submitting it as a feature length film! We all know Twitter is simple yet powerful, but this site seeks to popularise it’s true functionality in time for the upcoming boom in lifestreaming. Proudly powered by WordPress Theme: Twenty Fifteen Remixed.